Classic shotguns at Belheim Palace. 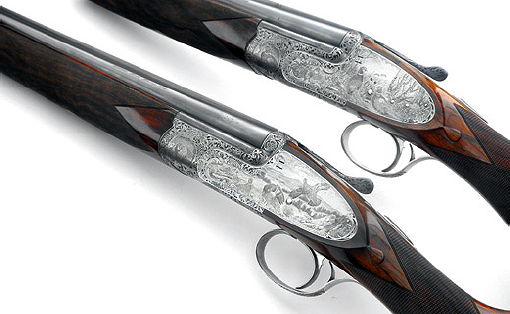 Among the exhibits are a magnificent pair of 20-bore Luciano Bosis sidelocks, beautifully engraved by the master engraver Pasotti, and a 12-bore Desenzani engraved with duck and snipe. Patrick Keen and Coys held their first gun auction in 1990 when they achieved a record price for a Boss over-under 20-bore shotgun which sold for £35,000. Recent notable sales include a pair of McKay Brown 16-bore shotguns which fetched £32,000 and a stunning Daniel Fraser double-rifle which sold for £45,000.